Early reaction from Northern Ireland captain Steven Davis and double goalscorer Kyle Lafferty. 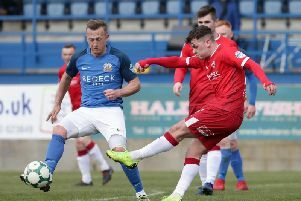 A 4-0 win over San Marino in Belfast puts them third in their group two points behind the unbeaten Geramny and Azerbaijan who were 3-0 and 1-0 winners over Czech Republic and Norway respectively. It was about being patient. We moved the ball about well in the first half and got us into good positions. The quality of our final ball was maybe a little bit lacking. In the second half we kept persevering and again we got into good areas. The finishing again could have been a bit better but overall it is a good result and a good performnace. Kyle Lafferty - on being left on the bench and coming on and scoring two gaols. I was disappointed not to play but I understand Michael’s (O’Neill) decision. I have not been playing club football and If I had been in Josh’s (Magennis), (Jamie) Ward and Conor’s (McLaughlin) shoes I would be complaining as well. Michael made the right decisoin I am not fit and probably giving me the last 23 minutes of the game was the right call. I was happy to get on to the pitch and score two goals and set up one. It was completely the right attitude from Kyle when he came on. It will give Michael something to think about again. It was a big call from Michael in the first place because Kyle has been excellent for us. It was the right response from him. Kyle Lafferty - on playing Germany next on Tuesday night. We are playing the world champions, If you cannot get up for that game you need to take a look at yourself. It is going to be a tough game, a really different game from tonight. We probably will not see as much of the ball, but I have always talked about our heart and determination going into big games and it will be spot on again. Obviously we played them in the Euros and we lost 1-0. They are a good side and difficult to play against. But the lads will get for it and we will see where we go.